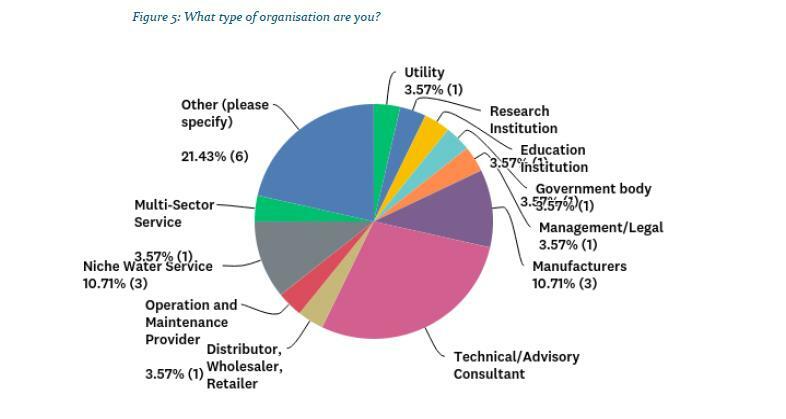 In September 2017 the Water Industry Alliance undertook a survey of its members. The purpose of the survey was to evaluate the Alliance’s performance over the year and determine what services member organisations value the most. The key results of the survey are provided below. The survey was distributed via an emailed link and included 50 questions as well as offering an incentive for completion. There was an 18% response rate. The performance of the Alliance was assessed via a number of questions that aimed to collect qualitative information from respondents. Generally performance was collectively assessed by “member satisfaction”. Around 76% of respondents indicated they are “highly satisfied” or “satisfied” with their particular level of membership and 8% were “unsatisfied”. The full survey highlighted a number of areas of improvement for the Alliance that are being considered by the team and are informing what we do and how we do it. The survey has provided information to the Alliance on what services are of most value to members and what communication methods are being employed. In the main, Networking Events and Company Promotion was seen as the most valued service offered by WIA Membership. Comments suggested a number of ways that these events could be improved. All forms of communication are valued and accessed by members and of particular note, 83% responded that they read the fortnightly eNews. The survey offered valuable insights regarding our members, their interests and our interaction with them. The results of the survey, particularly the comments provided in addition to the measurable data, are being actively considered and are informing future operations of the Alliance. If you have any further questions about the survey results please email Rachel Barratt.